How to make tea room recipes come alive at home. How to make Frittata and apple pie. When I think of tea rooms and the warm atmosphere and comforting foods, I immediately think of apple pie – warm, filling and utterly delicious. The other thing I love having when I go out for tea is an omelet. A French omelet, when cooked properly, is a thing of beauty. 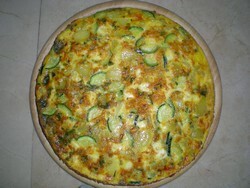 Frittata - Recently I have been making frittata, a cross between Spanish omelet and quiche! It is perfect – robust and tasty. You can use whatever flavors you like but as I am a fan of Greek food, I use feta and mint – odd, but it really works! Apple Pie - My mother-in-law has a fabulous tea room recipe that uses cheese in the pastry, which sounds odd but goes perfectly with the apple flavor. Step1. On a low heat, gently fry the onion and potatoes until soft in the olive oil – the potato mustn’t break up or stick to the pan. Step 2. Before the potatoes are done, add the courgette and fry until soft. Step 4. Whisk up the eggs in a bowl. It is important that when you add them, there is enough oil in the pan. Step 5. Add the eggs, feta and mint and stir once gently to mix. Step 6. Then simply leave on a very low heat to cook – do NOT stir. Use a spatula to loosen the edges from the pan once they are solid but be careful not to break the egg as it cooks. Step 7. You have a choice here – you can use a plate and turn the omelet to cook on the hob, or if that seems a bit difficult, simply place under the grill until golden on top. Step 8. Serve on a large plate garnished with a green salad. Step 1. Make pastry: Using the pulse function on your processor, mix the fat (50 g butter and 50 g shortening) and flour into a breadcrumb texture. Step 2. Gently mix in the grated cheese. Step 3. Add one egg, salt and some iced water and mix until formed into a ball. Step 4. Split the ball - one a little larger than the other and place in the fridge, wrapped in cling. Step 5. Preheat the oven to 200 degrees/gas 6. Step 6. Fry the chopped apple in 80 g butter, with the nutmeg and clove, until very soft. Step 7. Beat 2 eggs and add ¾ to the apple, with the sugar. Step 8. 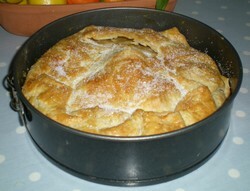 Roll out the large piece of pastry and line the tin. Add the apple mix. Step 10. Cook for 20 mins and then turn the oven down to 180 degrees/gas 4 for 30 mins. Step 11. Serve with custard – a tea room favorite.